It seems like only yesterday that The Rock announced a shooting start date on Jungle Cruise, Disney's latest live-action adventure based on a popular theme park attraction. Now, as all things must, this production comes to its inevitable end. But not before star Dwayne Johnson sent out a final video from the set featuring the cast and crew. "It's very bittersweet to have something so uniquely special come to an end, but myself and my one and only virtuoso, Emily Blunt proudly say, that's an official wrap of our epic Disney's @JungleCruise." Jungle Cruise revisits the iconic Disneyland ride, which has been a staple in the park since it opened. It's a grand old timey adventure that is sure to be another big hit for Disney, with The Rock very much open to turning this into a franchise. It could very well become Disney's next Pirates of the Caribbean. In The Jungle Cruise, Dwayne Johnson plays a river boat captain fashioned after the boat captains on the ride, so you know this skipper will be full of funny one-liners about all the dangerous animals and natives that await around every bend in the river. The captain will be transporting a brother and sister team played by Emily Blunt and Jack Whitehall, who are on a secret mission to find a mystical, mythical supernatural tree believed to bring healing powers. Wild, ravenous beasts and a competing expedition will give our heroes something to contend with as they try to traverse the dangerous waters, and what lurks underneath. Edgar Ramirez and Jesse Plemons will be playing a couple of old school Disney villains who are trying to beat The Rock and his crew to this magical tree. Ramirez is a retired conquistador who is leading a German expedition down the river, with Plemons playing the real bad guy at the heart of this jungle thriller. Jungle Cruise has a script from Star Trek Beyond writers J.D. Payne and Patrick McKay. Logan writer Michael Green came into give their words a polish during production. Dwayne Johnson is producing the movie alongside his Seven Bucks Productions team of Dany Garcia and Hiram Garcia. Frequent collaborator Beau Flynn (San Andreas, Baywatch) of Flynn Picture Co. is also on board. John Davis and John Fox of Davis Entertainment will also produce. Jungle Cruise is the latest in Disney's Theme Park Franchise, which includes such hits as Pirates of the Caribbean and the Haunted Mansion, along with some misses that include The Country Bears and Tomorrowland. Hey, they can't all be winners. But Dwayne Johnson sure hopes they knock it out of the park with this one. Jungle Cruise began shooting in May, culminating in a five month shoot. Now, The Rock is moving onto the Fast and Furious spinoff Hobbs and Shaw, not taking a single moment to catch his breath. His co-star in that movie, Jason Statham, has already been on set for more than a week, so The Rock has some fast catching up to do. 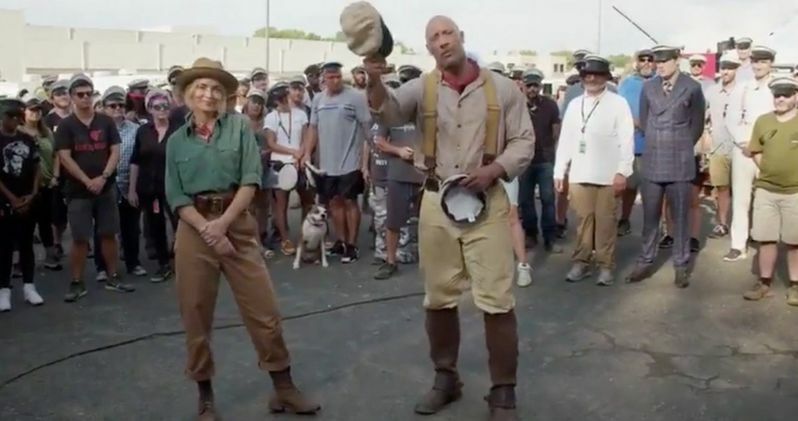 You can check out Dwayne Johnson, Emily Blunt, and the rest of the gang in this final farewell set video. It was delivered direct by Walt Disney Studios.